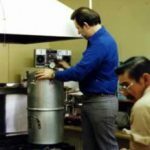 EDITOR’S NOTE: Since Gary Young’s passing, we have been taking stock of the tremendous contributions he made to the world by revisiting his presentations such as this fascinating twenty-part blog post series that recounts Gary’s ongoing discoveries about pure essential oils, their properties, and their production. Here’s Part IX. 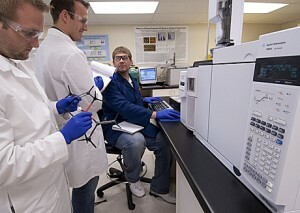 Our research and quality control laboratories in Utah have three gas chromatograph (GC) instruments. Two of these GC instruments possess dual-FID detectors, auto-injectors, and auto-samplers. The FID (flame ionization detector) counts carbons in the aromatic molecule so that its structure can be compared to a reference sample. Auto-injectors automatically inject the essential oil, and the auto-sampler allows you to program a series of injections for precise quantity and timing if you run multiple samples in sequence. 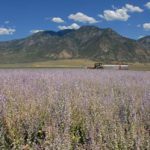 We use these instruments daily to routinely evaluate every new batch of essential oil that enters Young Living to verify that it meets strict Young Living Therapeutic Grade™ standards, a term that I coined in 1991. The third GC instrument has an FID and mass spectrometer (MS). This third GC-MS is reserved for research to identify individual components of new essential oils before they are introduced to members. We are also adding a polarimeter, which measures optical rotation. Optical rotation allows us another means to check for purity and possible adulteration. Our essential oil chemical reference library has over 280,000 compound references that have taken us 12 years to compile. Today, with the instruments Young Living owns in our two laboratories, we possess the most advanced and complete laboratories in North and South America for the analysis of plant compounds and their identity. Our instruments are the only ones in the world that are matched and calibrated to the instruments used in the Central Service Laboratory in France by Dr. Hervé Casabianca, who was on the directing committee that wrote the AFNOR Standards, which are accepted worldwide as the average essential oil standards. With Dr. Casabianca’s help, Young Living is raising the bar for the standards of essential oils.